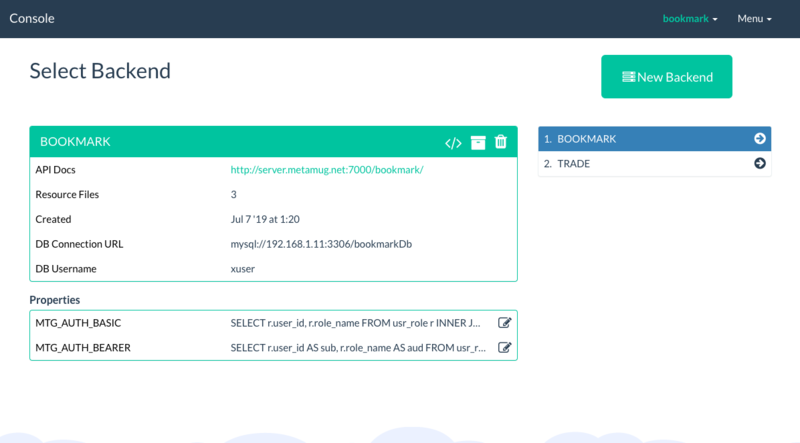 The Metamug Console allows developers to create and manage their REST API backends, resource files and to make queries to the SQL database. A developer first needs to create an account using the Metamug console before they can start using the system. The Backends screen is used for creating new App Backend and also displays the details for existing Backends in an account if any. The Resources screen enables uploading of Resource files and displays the list of uploaded files. After selecting the New Resource option on the resource screen in the console, the user will be prompted to select either one of the above options. The Metamug Console allows direct uploading of the XML file. On uploading, the file is validated upon uploading. If it is a valid resource file according to the Metamug resource format, the resource is added. Otherwise, the console will show the error present in the file. The console provides a text-editor which allows the creation of a resource. Also, an already created resource can be edited using the text-editor. The edit button is present under the Options tag in the resource listing in the console. The Metamug Console provides an SQL Editor which allows the user to access and perform operations on the database connected to the backend. The results of the query are displayed below the editor panel. After creating and setting up the database tables, the user can write the SQL queries to be executed on the database when a request is made to a particular resource, inside the resource file for the particular data resource. For more information please go through the Resource File section. PL/SQL can be executed on the same editor by switching to PL/SQL Mode on the top right corner. Editor by default stores the last query executed. So data isn't lost when something goes wrong. The Console related data like user-account, backend meta-data, resource meta-data is stored in an internal database. You can migrate this to your own database using this doc.